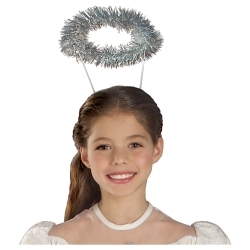 Make your angel costume sparkle with this silver tinsel angel halo. This angel halo has a clear head band with silver tinsel around the outside of the halo that makes it sparkle in the light. Add a pair of our angel wings and a harp to complete the angel look. The angel halo is colored as pictured, measures 4.5” in diameter, and will fit any head size using the adjustable headband.